We’re so lucky that the host with the most is also one of our partners in design. 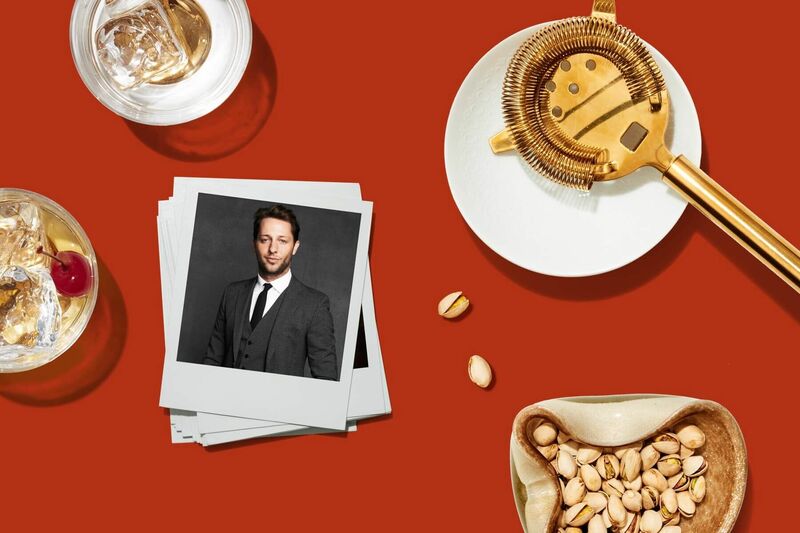 Derek Blasberg, noted New York City bon vivant (and an absolute must-follow on Instagram), is the sign of a good party—whether he’s hosting it or just in attendance. His presence puts a magic touch on anything, even this interview: we came looking for tips and left so inspired, we’re planning our holiday party as we speak. 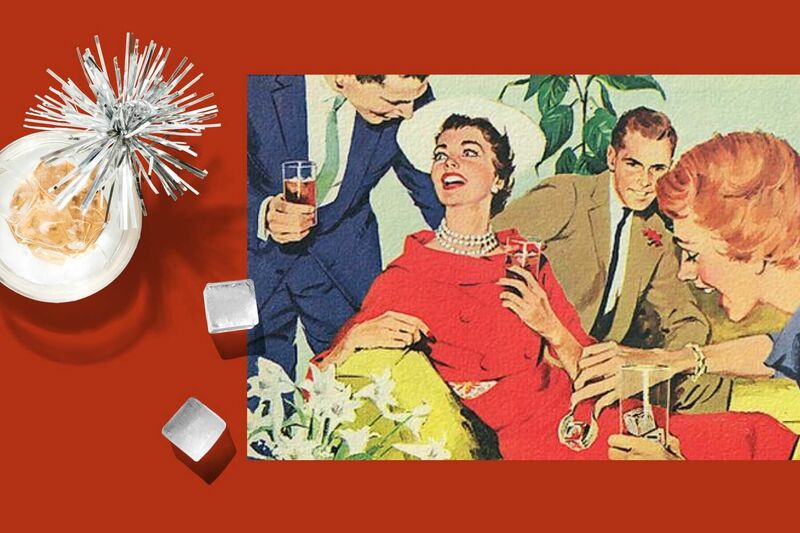 What’s the kind of holiday party you dread going to, and how would you shake it up? Office parties can be pretty brutal, and I’m just talking about the lighting. Every office is different, but I’ve found that in every work space there’s a de facto social director, so it’s nice when that person takes the charge in these situations and makes an office party their own. Have a theme, make some joke awards, organize a silly game. It’s corny but it’s fun. Embrace the corn. Sometimes, the corniness is even a bonding experience amongst colleagues. And, for heaven’s sake, turn down the overhead lighting and light a few scented candles. A pair of Russian porcelain dinner plates from the Kremlin Service, Imperial Porcelain Manufactory, St. Petersburg, Period of Nicholas I (1825-1855), 1837-1838. Sotheby’s. 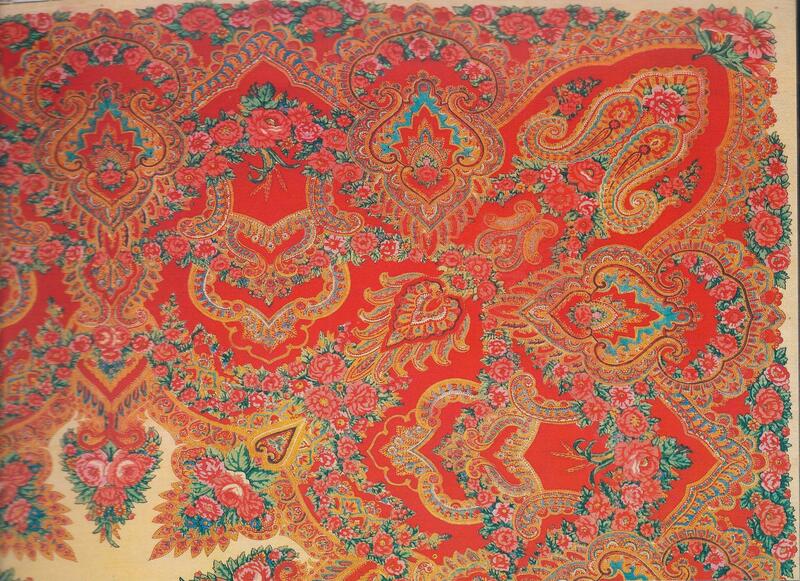 Shawl, Photo credit: Hauntedohiobooks.com. 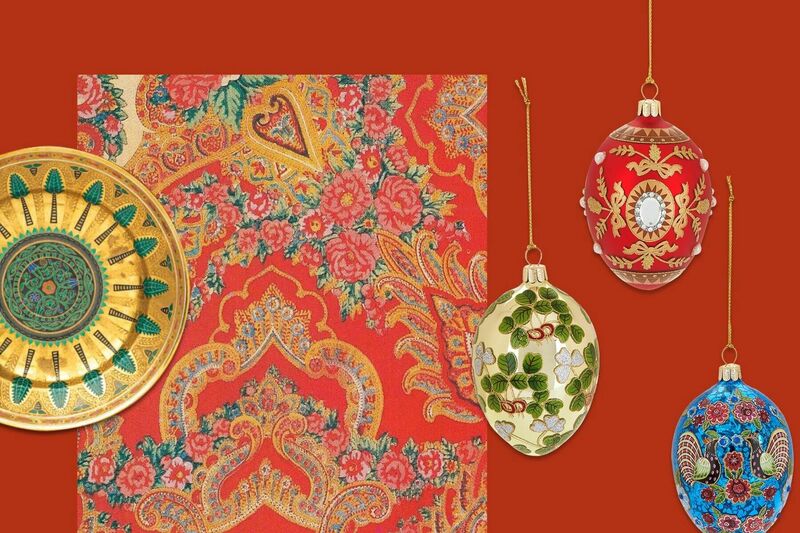 Joan Rivers 2017 Set of 4 Russian Inspired Egg Ornaments, QVC. Conversely, what’s the most unexpectedly fun holiday party you’ve ever been to, and what do you think worked about it? Last year, a friend and I organized a last minute holiday party at a Russian restaurant in Midtown. No one had been there (including me and my friend), but there was something especially, unexpectedly festive about the traditional Russian dress, the traditional tchotchkes, and definitely the dozens of different vodka selections on tap. Vodka helps everything. What’s the secret to a truly memorable holiday party? The trick to a good holiday party is an unexpected guest list. For the past few years, my friend Dasha and I pair up to co-host a Christmas party, and we cast a wide net on the guest list. There’s young and old, uptown and downtown, underemployed and overemployed. Andy Cohen does a Christmas party and it has the same vibe: there’s Oscar-winners talking to Real Housewives. It’s always about that mix. I should also mention it’s the hosts’ job to make introductions, do the rounds, grease conversations. The hardest part of throwing a good party is making it look easy. Are you ever worried about who you have or haven’t invited? I know some people get anxious about offending people by inviting someone they don’t like or blah blah blah. All those social politics are silly. Do your hosting duties, but invite fun people and if they don’t like each other they can avoid each other. That’s their problem, not yours. Scripted icebreakers are corny, but how do you get people to loosen up and start talking—or start doing other stuff, too? I get asked this question a lot, which is because I can literally talk to anyone, even a lampshade. (That’s another story, but it involves more vodka.) Sadly, there’s no secret to party chit chat. You have to give a damn about what someone else is saying. That doesn’t mean pry or interrogate a new friend at a holiday party, but the trick to getting people to open up and have fun is actually listen to what they’re saying. That’s easy for me because I’m naturally curious and I’m always on the hunt for some good chat. People like to talk about what they know, so find out what that is. If you’re wondering, it’s probably cheesy. How do you end a party well? And how do you know when it’s time to go? For any party, you want to have an escape plan. Is there another party going on after yours? Send people there. Or, is there a nearby lounge that you can head over to when it starts to wind down? The worst part of a party is when it sort of whimpers out, and going till the wee hours of the morning is not a requirement of a “good” party. I’ve ended some parties at midnight. Just shout “last call” and kick everyone out. Do you have a social media policy at your parties? Yes, I make sure everyone tags me. Kidding! I have some friends who politely mention on an invite not to post, which is fine and totally their prerogative. I don’t mind either way. My only rule of thumb: FaceTune onto others as you would FaceTune onto yourself. How do you entertain a crowd of mixed ages—whether that’s a holiday party with kids in tow, or a party with grandparents in attendance? In my experience, the older generations love to mix with the younger generations. They just want to have a seat while they’re doing it. So get them comfortable, get them a drink. How do you feel about props and party favors? If positive, what are some that you bring or share at a holiday party? I love a prop. This summer, I was in Paris for the couture shows over Fourth of July, and I organized lunch at an American bistro and brought a whole case of star-spangled hats, flags, leis, miniature flags to put in the drinks, and so on. People who don’t like props are just unpatriotic. For some harried, but hopeful host, which of your invitations would you recommend for a holiday party, and what do you recommend she do to entertain the hordes? 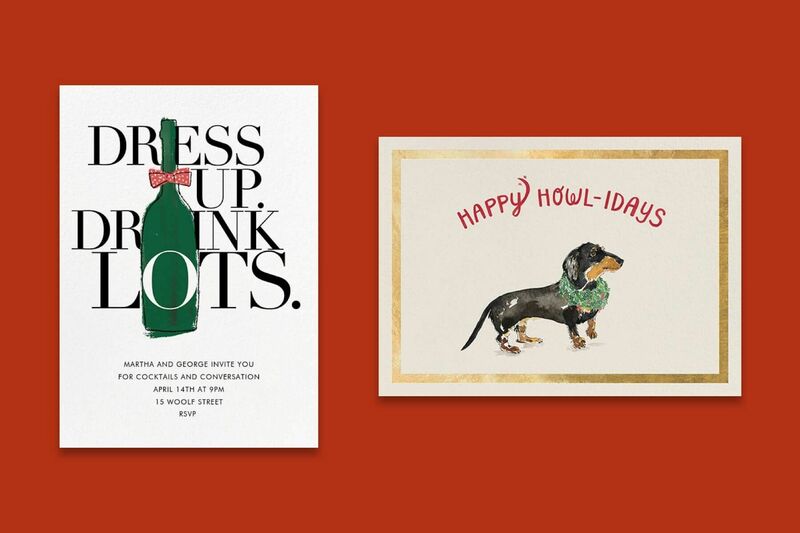 I have one card that just says ‘Dress up and drink lots,’ which sums up my holiday party ideology fairly well. And another card that I love to send every year because it features my beloved dog, Monster. Happy Howl-idays, everyone! Start the hijinx in earnest with the perfect holiday party invitation—from Derek Blasberg or from our full collection.